William Franklin "Billy" Graham turned 99 years old today. This Protestant evangelist is known for massive Evangelical crusades and a career that has reached perhaps more than 100 million people with the Gospel of Jesus Christ. Along with his wife and children, the Graham family has collectively shared the Gospel with multitudes and been stalwart defenders of conservative Christian values. I believe this is just one more small sign that we are nearing the culmination of prophetic events pertaining to Jesus' return. The Gentiles from every nation have now heard the Gospel. The time of the Jews is coming. God will fulfill His eternal promises to them. Mohammed bin Salman (pictured left), is the current Crown Prince of Saudi Arabia and heir to the throne. If you haven't heard, he has just led a massive crackdown in the country, arresting dozens who might oppose his rule. News of late has reported that he intends to transition Saudi Arabia into a religious oasis and abandon hard-line Islam. On top of that, he wants to build NEOM, the largest city in the world, a sort of modern-day Babylon, near the borders of Egypt, Jordan, and Israel. Now news is breaking that rhetoric between his government and Iran is heating up to the point of war and both sides are doing little to calm the situation. The next event on my radar is the upcoming Jupiter-Venus conjunction on November 13th. It seems to continue the celestial story of Revelation 12. I suppose it's just a sign of things to come, but it is very interesting nonetheless and we would all do well to be especially watchful as the Fall 2017 window comes to a close. The Great Sign of Revelation 12:1-2 (or perhaps more technically, Rev. 12:1-2a) was fulfilled on September 23rd to 24th. Based on my understanding of the sequence of events in this chapter, the next event to be fulfilled is the rapture of the Church rather than the Sign of the Dragon. Jupiter was "born" on either September 9th or October 13th depending on which set of stars you consider to be the boundary of Virgo's womb. The next "sign" we might expect to see is the catching up of the male child to God's Throne and November 13th is a good candidate - at least for the male child (the Church) being joined to the Head (Christ). I want to emphasize that I only see this as a possible sign, and like I've always said, signs and the events themselves don't necessarily happen at the same time. In short, Venus represents Christ (Rev. 22:16) and Jupiter represents the Body of Christ (Jesus Incarnate + the Church). 26 To the one who is victorious and does my will to the end, I will give authority over the nations— 27 that one ‘will rule them with an iron scepter and will dash them to pieces like pottery’—just as I have received authority from my Father. 28 I will also give that one the morning star. The fact that the Body and Head come together shortly after Jupiter's September or October birth is quite interesting. That's exactly what we would expect to happen if Revelation 12:5 and Revelation 2:28 played out in the heavens subsequent to the Revelation 12:1-2 fulfillment. 1. Jupiter (the male child) leaves Virgo (the woman, Israel), around the same time Mars (war) enters Virgo. This is the exact order of events prophesied to occur in relation to the Tribulation. The Church is raptured and then Israel enters into a period of war and tribulation. 2. In October, after Jupiter is birthed, the planet moves from being visible in the evening sky to being visible in the morning sky. The child transitions from a child of darkness to a child of light. We are called "children of the light and children of the day" (1 Thess. 5:5) in the same passage of Scripture where the rapture is revealed and described. 3. Considering that Venus represents the Glorified Christ, once we are also glorified, we the Body will be joined to the Head and we will be with Christ forever. We will never be separated from Him again. Since we will be glorified, united with Christ, and given co-rulership with Christ, there would seem to be a transition and transfer of sorts. For this reason, it might be better to look only to Venus after the November 13th conjunction. For the entire Tribulation to end on Yom Kippur 2024, the Tribulation could commence no later than November 19, 2017, seven days (inclusive) after the conjunction. This pattern fits the "days of Noah" mold where Noah and his family entered the ark seven days before judgment fell. And guess what happens just as November 19th comes to a close and November 20th begins? Venus has entered Libra, the Altar - the Throne Room of God. The male child appears before God's Throne, united with the Head. I have to be so careful here because I've learned that many are quick to jump on you, label, and accuse (falsely). The dates here in #3 are factual in regards to the astronomical events, but I'm only speculating in regards to the timing of the Tribulation. It is simply a nice fit that has caught my attention. This announcement re: Billy Grahm is timely. I state this because Stephen Behoon (sp? )from the Israeli News Live YT channel had a rapture dream (from 2013).... so the "interesting" part of his dream was the specific event --> BG passed 'shortly before' the Harpazo. 'Perhaps' another connection or signal. Listen from the beginning to the 1:45 mark for his dream/ revelation. Will the passing of BG signal the closing of the Church Age?? Time will tell. 1] US Prepares for War Against...IRAN! 2] Are We Just Too Confused to Know What Time it 'really' Is? Could this be the antichrist? Just curious if he fits the description. Re: The picture of Mohammad Bin Salman and President Trump. 1] The crackdown on the elites within Saudi Arabia. 2] The missiles launched from Yeman into Saudi Arabia. He's definitely on my radar now! I have been wondering about him also. Does anyone know if he is married? Very interesting indeed. However, we are not reading the real news from the MSM...I was a sucker for posting a MSM article earlier (apologies). SA will team with Israel (and USA) vs. Iran (backed by Russia and China), Turkey, and others...man o man, get your *Harpazo* (see bottom) shoes on! So very interesting, thank you! I too had searched Scripture to see where 99 was mentioned. I wonder if paying attention to the Methusaleh star may be beneficial, after reading Wendy Wipple's excellent write-up. Thanks for the good update Gary. NEOM (possible candidate for Babylon), and the Iranian/Saudi war rhetoric is particularly interesting. Daniel 7/8/11 and Rev speaks of Iran (Persia/Medes) as the ram with two horns taking over the majority of the Middle East. We have been watching this unfold for the last few years (Mark Davidson has a marvellous book on this called 'the four signposts'). We will also be expecting at some point Mecca's destruction (as the harlot woman in Rev). So a very interesting time in the ME at the moment! You're most welcome. This whole NEOM thing came out of nowhere! Sherry - yes he did mention that in mideast beast from what I recall. NEOM is a different 'city' to what Joel originally proposed. I think it was aligning mecca and Jiddah and somewhere else, however NEOM is on the other side of SA. Good hint Sherry but please allow my question: if tribulation period has started, how will anybody still ever build sth alike here on earth? When desaster increases, meteorites fall from heaven, war, hunger, pestilence and FEMA? Who's still gonna build a mega city during those conditions which are WORLDWIDE then? I noticed the 6/30/15 Venus-Jupiter conjunction was missing from DM's timeline. After doing the day count, I found it to be 867 days [to 11/13/17]. The ancients called them planets because they were indeed wandering stars and then they were given the names of their gods. The first known use of the word ‘planet’ in English, according to the Oxford English Dictionary, was in the year 1300 in an account of the lives of Christian saints. In other languages, though, the word dates back much further. The word ‘planet’ comes from the ancient Greek ἀστήρ πλανήτης (astēr planētēs), meaning ‘wandering star’. The ancient Greeks, like the Babylonians, associated the planets with gods, often corresponding with the Babylonian pairings. Other ancient societies, like those in China and India, also connected planets with personal attributes and predictions of future events, in what would later be referred to as astrology. Is it possible the Red Dragon in Revelation 12:3-4 is indeed one (or all) of these wandering stars (not Nibiru or Planet-X as the science community would say) which will come crashing down to earth? Is it possible the wandering stars of the Bible (well, using Enoch in this theory) could be the dwelling place for a majority of the "fallen." Now that's pretty interesting. It definitely means "departure" in several verses (Strong's 867 that is). Charlie, DM had another chart in the article which has the J/V conjunction marked on it as well. http://watchfortheday.org/wpimages/wp6b2a9a77.png It may not pop in, but you'll be able to get the link anyway. Here are a few links on the 6-30-15 V/J conjunction. This did not make it onto DM's chart because the 867 day count did not hold significance (compared to 777 for example). 1} Throughout the month of June 2015, the two brightest planets in the night sky, Venus and Jupiter, are converging for a jaw-dropping close encounter on June 30. Don't forget, the Alien (A-LIE-n) and Satellite (s-A-te-L-I-t-E) deceptions. These flat earthers insult my intelligence. Absolutely ludicrous. 3] Unsealed (and other intune sites) have a number of articles on the coming "Alien Deception." Who has helped program and prepare the world for this coming deception? NASA & the Vatican (who controls NASA). Charlie...I totally agree about a NASA alien deception...that I expect. But the physics thrown out there trying to show the earth is flat is so ludicrous. If someone believes the earth is flat, then I am not going to waste my time trying to change their minds. But, I get a lot of chuckles watching the videos that "prove" the earth is flat. I am an airplane and helicopter pilot , and the videos out there are pure comedy. Hello brother Stan, glad to know you are still reading and checking in from time to time. Would love to go flying with you, we soon can do it in the heaven above. From Think About It (11/3)- Why Would NASA Fake a Globe Earth? Q: "Why are both Jesus and satan referred to as the morning star?" A: The first reference to the morning star as an individual is in Isaiah 14:12: “How you have fallen from heaven, O morning star, son of the dawn! You have been cast down to the earth, you who once laid low the nations!” (NIV). The KJV and NKJV both translate “morning star” as “Lucifer, son of the morning.” It is clear from the rest of the passage that Isaiah is referring to satan’s fall from heaven (Luke 10:18). So in this case, the morning star refers to satan. In Revelation 22:16, Jesus unmistakably identifies Himself as the morning star. 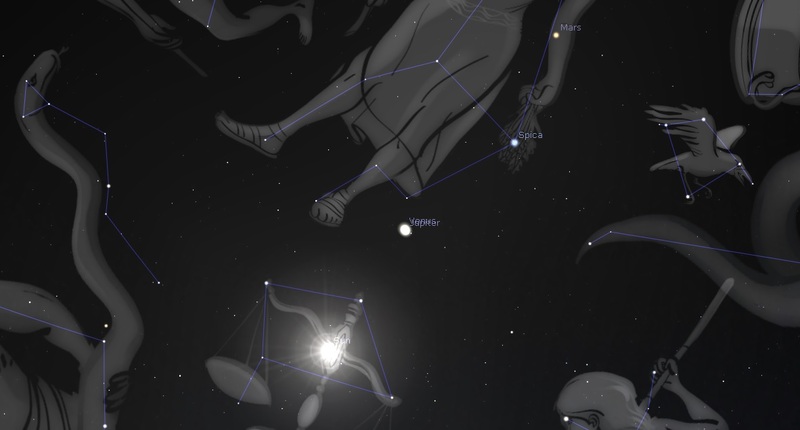 Why are both Jesus and satan described as the “morning star”? The idea of a “bright morning star” is a star that outshines all the others, and Jesus is the One who is called “bright.” While satan was a morning star, Jesus (as God incarnate) the Lord of the universe, is the BRIGHT and morning star. Jesus is the most holy and powerful “light” in all the universe. So, while both Jesus and satan could be described as “morning stars,” in no sense is this equating Jesus and satan. satan is a created being. His light only exists to the extent that God created it. Jesus is the light of the world (John 9:5). Only Jesus’ light is “bright” and self-existent. Thus, satan may be a morning star, but he is only a poor imitation of the one true bright morning star, Jesus Christ, the light of the world. Wondering about overcomers being "given the morning star" at the rapture. Minutes (or hours or days how long does the war last?) later, after the conjunction of Venus and Jupiter, Satan is thrown down to earth and probably will make a big deal about his appearance at the time of the Venus Jupiter conjunction. Satan will probably at this time start calling himself the morning star. Maybe. Dear @all please consider the PLURAL in Job 38:7 "morning starS" - so the concept behind seems very easy to me: as angels are equalled with stars so the "sonS of God" (Job 1:6) are the same angelic PLURAL. Mentioning Jesus Christ as THE (only and real!) morning star breaks down the meaning of "original" (Jesus) and "replica" (Satan). I agree with the idea that the unsaved left behind are deceived on earth by the antichrist "replica" the first horseman of Revelation 6:2 whereas the true saints are given the REAL morning star, Jesus Christ the original, the only one "Faithful and True" Revelation 19:11 I have already met many of those on Youtube who cling to deceptive lies about the rapture and tribulation period and cannot be convinced of the true gospel anymore. They will definitely believe the lies of 2 Thessalonians 2:10-12 and get lost. What about REV 11?? I read all this info about REV 12 but nothing on about 11? Has this sign already been fulfilled?? Very, VERY confused. Hey Mark, I understand why you're wondering why most people aren't looking for Rev 11, but from what I can tell, Unsealed and most of us on here understand scripture through a dispensational framework which most often leads to a pre-tribulation rapture view. Rev 12 pictures the rapture before great tribulation and that means we look for our blessed hope to come before the two witnesses hit the scene. Hope this helps. Thanks Rob! It's weird that Rev 12 came before Rev 11. Excellent Rob...I think I read a old book about Rev in general and the author I think said the same thing. Thanks Rob for taking the time to answer my question. Till our King 👑 comes...Peace! A book on Revelation, Wonderful Counselor, by Cynthia Sowa, long before the astronomical facts surrounding Revelation 12 came to be popular, suggests that Revelation 4 - 11 is one complete story of rapture through the tribulation because there is rapture at 4:1 and end of tribulation language at end of chapter 11, voices, earthquakes, lightnings, thunders, and hail. END OF 11, END OF TRIBULATION. THEN WE GET TO THE NEXT SECTION OF REVELATION - Revelation 12 to 16. Rapture of Church in 12, end of tribulation language in last 4 verses of 16. Voices, lightning, thunderings, earthquake and hail. Then next section - Revelation 17 & 18. No mention of rapture because this is dealing with destruction of Satan's kingdom and the rapture has nothing to do with it. Then next section - Revelation 19 & 20. Jesus comes back to reign for 1,000 years. 1. First section begin Revelation 1, what John saw. 2. Second section being the Church Age, Revelation 2 & 3. 3. Third section being Rev 4-11. Tribulation from perspective of heaven looking down. 4. Fourth section being Rev 12-16. Tribulation from perspective of earth looking up. 5. Fifth section being Rev. 17&18. Destruction of Satan's empire. 7. Seventh section being Rev. 21&22. The future. I know Cynthia and she wrote her book over 20 years ago before the Revelation 12 sign astronomical idea was even known. She called it. Revelation 12 speaks of the rapture not the middle of the Tribulation. Does the Billy Graham story now mean that this man will be finally born again at that age and become a Christian? Because he's NOT YET. He's one of 1 John 2:19 he's not saved at all, neither is most of his family (except perhaps Anne Lotz and his wife Ruth). His whole life shows a constant way of spiritual decline and apostasy into ecumenism and one world religion. This man is not saved. His son Franklin has adopted his ecumenical beliefs and teachings too. I happen to agree with you there...seeing him with ex president bush sorta turned me off and made me curious. Bush is satanic as they come...Wolves in sheep's clothing. I am rewording my previous comment, because writing it on my phone left it with some errors and lack of clarity. Annabel, may I kindly and gently caution you? You may be right, but it is a hard one to swallow and many would know Billy Graham as a Godly man who has represented Jesus correctly. Saying He is not saved may confuse some and also comes off sounding like you have insight into his heart. I believe only God knows our hearts. Obviously our fruit is a clue to our hearts. It sounds like you have seen his fruit and feel it is not good. If you know of things about him that are not good then I would think forgiveness, rebuke, and/or bringing to light are better than just accusing him of not being a christian. Reticentindignation, some of that gentle caution, I would give to you as well. I say all this, recognizing there may be folks reading this now or in the dark future that need things to be as clear as possible. I am starting to see signs that indicate the deception and confusion are going to amp up in a way that we have never imagined. I hope I have been as gracious as I have intended and am building you up. 2013 interview with Larry King- Who is Going to Hell? Can you provide some links to articles/videos/books proving your claim? I learned long ago, never question someone's salvation status -- because one cannot know the heart of anyone but their own. I do know for a fact that Billy Graham was used mightily for God, to bringing several hundred (thousands) to the saving knowledge of Jesus Christ and these people were out of the lime light -- so no reason to "fake" their conversion. 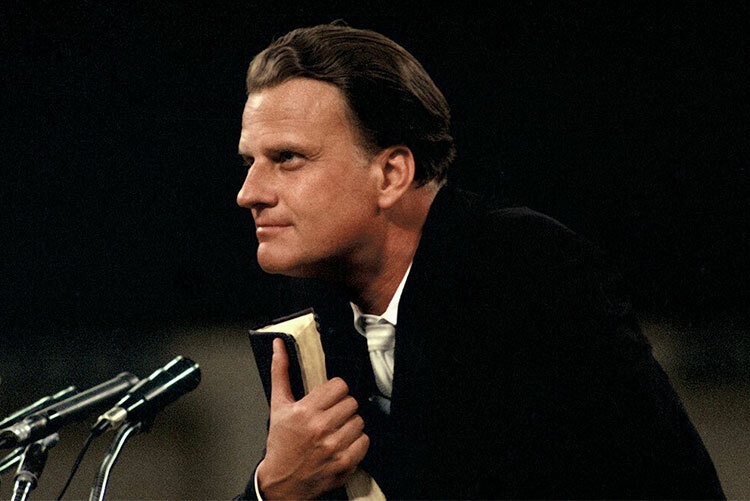 Dear @cautious people, I just recommend to do an internet / Google / YouTube research using the key words "Billy Graham apostate" and you will get more plain literal evidence from his own sermons and teachings than I could ever give here in short. This man is not saved. That doesn't mean he didn't preach the true gospel (during his younger years) so you can indeed have true conversions as a result. But Gods word does not depend on the preacher. God used Balaam to bless Israel, same to BG. But after he more and more compromised with the Pope and the world the more he deceived the masses into Arminianist "Decisional Regeneration" which is works gospel too (Charles Finney false "free will" teaching used for altar calls and church growth in numbers). Anyway, check it out for yourself, I don't worry about my discernment before God according to 1 John 2:19 so don't worry about me please. I wouldn't make that statement if it wasn't backed by scripture. I cannot see good fruit indeed in BG's career along to Gods word. And his son Franklin is doing the same thing. Blessings to you! I have no dog in this hunt, personally, apart form a concern for the Body & our Lord's Name. However, remember, the Sword of the Spirit can be wielded, effectively, by the unsaved. So much so, that the results of that 'work' will allow these to convince THEMSELVES they are 'saved' when they are NOT (Matt 7:22). Maranatha! Thank you for your responses (and the homework). May we all work out our salvation with fear and trembling. -- Philippians 2:12-13 and May we fix our eyes on Jesus. -- Hebrews 12:1-2 and May we continue looking up -- Luke 21:28. The things around us can be disheartening, deceptive and distracting. The many verses in the Bible that tell us to look up or look toward Jesus are teaching us how not to be disheartened, deceived and distracted. Lord Jesus, I pray for these people now and later who come to this website, that they may find You and know You and accept Your saving grace. May those who have lost their way, repent and return to You. May satan be crippled in his efforts to deceive and may Your truth prevail. May your will be done. Come quickly Lord Jesus. Amen. oh goodness, I spoke too soon...it seems Palm Springs California now has a city council that is 100% LGBT! what is going on!!!! Gary thank you for taking the time to touch on these most pressing subjects. Don't fear researching it yourself, Anon: you will find enough material from BG exposing himself (from original recordings). Blessings to you! Isaiah dear brother this is not the case unfortunately: read 2 Thessalonians 2:10-12 to clarify. A 2nd chance Christian wouldn't make sense in fact if judgement is still judgement. It's like the Roman Catholic "purgatory" concept that could "save" dead people from hell who have not believed in Christ before dying. So the rapture definitely SEPARATES the wise virgins from the foolish ones, both claiming to be part of the church. Once and for all. I believe so that fence-sitters will still have the chance to get saved after the rapture. Same goes for many "cultural-only" Christians for whom the rapture will be "the wakeup call". Otherwise the countless numbers of tribulation believers the Bible mentions weren't possible. On the other hand, indeed, there will be people who are going to believe the lie and they’ll be deceived, who were actively hated the truth as the Bible says. Who are they exactly only the Lord knows. Only He knows the hearts of men. Maybe "actively" isn't the best choice of word. What I wanted to emphasize is that those people really hated the truth. But again, only the Lord knows who these people are. Interestingly, Funny...and Awesome, Little Shaul (Zeus Mossbender Channel) has produced a new Shamayim Report. At the 20min mark he has a chilling word about these signals from Elohim. I have heard Rev. Franklin Graham on Hannity's show say Jesus is the ONLY WAY to heaven. He and his charity Samaritan's Purse have built practically all the churches in South Sudan and so many other places. I see this as his fruits. He has risked his life countless times doing God's work in some very dangerous places. You always have to look whom a preacher makes friends with (James 4:4). If he compromises with the RCC in general you can just forget about him (and his creed!). Gary, in your 2017 to 2024 Rapture Theory article, you said there would be an intercalary month in 2024. Does it help that the barley harvest was a month late this year, thereby pushing or resetting the Feasts back a month ? When you read Rev. 12:7 which occurs after the child is caught up in verse 5, it states, “And there was war in heaven: Michael and his angels fought against the dragon; and the dragon fought and his angels,” if Saturn represents Satan (dragon), and Mercury represents Michael, this could help us narrow the time frame down to a possibility of Nov.13th (Venus-Jupiter conjunction) - Nov. 19th (Yom Kippur 2024 timing). 33 So likewise ye, when ye shall see all these things, know that it is near, even at the doors. Symbolizing the 3.5 year mid mark of Trib. * This timing fits as well. Diana, thank you for unpacking a bit of Saturn's journey through these moments. I posted a comment on Watchmanforthatgreatday's YTC last video asking him to do the same and hadn't seen anything there yet (not having geared up to work in Stellarium myself yet). I would love to have someone (you?) give us a rundown on any and each significant arrangement involving Saturn while we watch Venus, et al, as my guess is, as your post hints at, we will see another set of significant conjunctions/oppositions during this same time. One last idea, we Watchers generally note the easy ones, the conjunctions, and I am curious to hear of oppositions as well. What if, for example, at significant points along the way, in addition to being conjunct with key planets, (Venus+Jupiter, for ex.) we find that they are ALSO apposing other key planets, such as Saturn. I mean, if Venus was conjunct Jupiter and opposing Saturn at or about the SAME TIME wouldn't that be an obvious thing to want to see? Maranatha! I feel it’s very dangerous to malign servants of God! Billy Graham is one of the few that actually doesn’t seem to be in it for the money. Anything can be twisted on the internet to sound like he was saying something heretical.. in my opinion he is a humble man of God whom God has used mightily. You can even take one bible verse out of context and accuse God of being cruel( like Richard Dawkins does). We are told in the Bible that we will know the false prophets by their fruits not by something they supposedly said! When we put our opinion out there and judge someone beware of making anyone stumble!! They are so many people who come to this site who may not be very strong in their faith.. they are the little ones that we should not cause to stumble! Notice when Gary also mentions scoffers he doesn’t name anyone and I think that’s appropriate! We all have to give account of what we say and also what we write! Fair enough, but I do not think these scriptures support saying "he is not a Christian" on the other hand saying "he is not teaching as a Christian and setting a biblical example" or something similar is supported by these. Subtle difference maybe. I feel silly pointing this out and hate to sound argumentative. Peace. the New Testament book by book. Today he read Revelation ch 20. So tomorrow will be ch. 21 and monday (Nov 13th)will be ch.22. The end? Darren, I'm good with that. Maranatha! Thank you for this interesting heads-up article, Gary! Maybe this will help those that have questions regarding what Billy Graham believes from his own mouth. Thank You Karen, what a good article, wow, and great site overall! I'm an older dog, but I learned allot today about several people and things. I will be using the King James as my primary translation from now on. Loved it! Thanks! Folks this is a site worth bookmarking! Blessed to be of service to my brothers and sisters in Christ. Provided you a link for buying KJV bibles below. This is where I purchase my bibles. Great Article Gary! Hal Lindsey, in recent years, told a story, how he and Billy Graham were Golfing, and while riding along in the Golf Cart, they were talking about the Rapture. Billy told Hal that though he was much older (11yrs) than Hal, he believed he too would live to go in the Rapture. I believed him then and it looks to me like that will be the case! lol! Hals Book [The Rapture] opened my eyes in 1988 and I've been Watching since. Billy Graham has been around my whole life and I'm excited he and Hal are with us and enduring to The End. Red Flag #1- The Marble was introduced to the world in the 1960s by NASA (thus, the Vatican). Red Flag #2- Everything NASA (thus, the Vatican) claims to have done/ accomplished has been a hoax or make-believe. Red Flag #3- If NASA (thus, the Vatican) is behind the hoax and make-believe, I cannot and will not believe any "information" they produce nor will I believe any "discovery" by them. Everything NASA produces is vetted by and controlled by the Vatican. Red Flag #4- It is a government organization. thus, it is not for the greater good of the humanrace but only a money drain for the bigger New World Agenda. Ive been FE since Oct.2015.I have found it impossible to help Christians see it. I figured I would just wait for the rapture and then minister to confused incorruptibles. Or they could minister to me. Hah. Blessings. I have loved all your responses attempting to put it out there. Our first view of the other side of the firmament will be spectacular. The article mentions Libra as the altar, but Libra represents scales of justice. THE "LAST DAY" (Why would she say "last day" in reference to Lazarus appearing in heaven, why not "first day" of resurrection? This day needs to be the last day of something I think) MARTHA MAY HAVE REFERRED TO WHEN SHE PROPHESIED (in the Spirit who inspires all Scripture) THAT HER BROTHER WOULD RISE ON THE "LAST DAY"…..
From Daniel 12, That's EXACTLY what all the Saints are going to be doing that day if the rapture occurs and we are taken to our place on the other side of the firmament where it will only be bright with the reflection of Jesus lighting even the sun. Interestingly enough, for Israel, as yet left behind, the Strong's Hebrew #826 is a word that means "CONJUROR". Perhaps, for those left behind, I am sure Lucifer is planning something deceptively special with his conjurors so that those on earth, after or even along with, the rapture, will be deceived… tremendously. He will do it with magic, demons, fallen angels and lies. Glad I won't be here if it occurs on day 826. 11. Pentecost is not only a day but it was the conception of the church. The church needs to be born again and in order for that to happen the group known as "THE CHURCH" needs to be a closed group after its 1984 year membership drive. This thing called THE CHURCH started in Acts 2 after a BEGINNING OF PENTECOST COUNT. What was started has not ended as people are still becoming Christians. The ongoing "effect" or "season" of Pentecost ends with the rapture at the LAST DAY, the end of the END OF PENTECOST COUNT, because after that, the group known as "The Church" is closed by virtue of the fact that at the rapture, the ENTIRE CHURCH is made incorruptible and eternal. 6) lit up and shiny. All of these elements are exactly what we will see at the Rapture of the Church at the END OF PENTECOST COUNT. There are those who already have responded to this and their first response is "Pentecost is in spring not in winter." This is like saying "No man knows the day or the hour." True statement when written but it does not mean what you think it means. I am not saying the DAY OF PENTECOST IS IN WINTER. I am saying the springtime day of Pentecost in Acts 2 started a process that will end at the rapture. I am saying that the Pentecost season, or process, does not have to end on the day it started to still be the end of the Pentecost season. It will end at the Rapture. The Rapture does not have to occur on the spring time feast day of Pentecost in order for the rapture to be fulfillment of the Pentecost count. The Pentecost count from Leviticus 23:15,16 (read it again and see) allows a count that was completed on day 50 AND it allows a count that will be completed at 99 days. One simply must start the count on a date that is a GREAT SIGN like the resurrection of Jesus was a GREAT SIGN. How about starting the Count on the Day of the GREAT SIGN. At the end of the count then, on December 31, 2017 perhaps we will see all 6 of those elements of the rapture: 1)gathered, 2) in an upper room, 3) joyous, 4) in one accord, 5) speaking one language (another post Babel language miracle), 6) and we will be changed and we will be lit up and shiny. Blessings Saints. Soon we rise and shine. This is point #3 in my 14 reasons why Watchers may want to take a look at December 31, 2017. 3. I submit that when Martha told Jesus that she expected her dead brother Lazarus to rise "on the last day" I think it is possible that the LAST DAY was the last day of the Count or the last day the Church would be corruptible on earth. Otherwise wouldn’t you refer to the resurrection of Lazarus as his first day being resurrected? Of course, Martha did not know this, but her words were inspired by the Holy Spirit who is very much attune to Pentecost, not only the day of its beginning but the day when He will no long indwell believers to make eternal new creatures. It is appropriate that the END OF SEASON OF PENTECOST COUNT will occur on the last day of its count, possibly December 31, 2017. What is this day the LAST DAY of? THE LAST DAY OF DECEMBER? THE LAST DAY OF 2017? THE LAST DAY WHEN THE CHURCH IS CORRUPTIBLE? THE LAST DAY OF THE PENTECOST COUNT? THE LAST DAY MARTHA REFERRED TO WHEN SHE PROPHESIED THAT HER BROTHER WOULD RISE ON THE LAST DAY…..? We will see. Blessings Saints. This is point #5 in my 14 reasons why Watchers may want to take a look at December 31, 2017. 5. Some have suggested that the rapture is a spring event (a beginning of Pentecost event) and thus use Song of Songs 2 to point out the spring-like conditions at the time the Groom is coming for the Bride. Read carefully every line of Song of Songs 2 and imagine this...the Bride is in her mansion(s) already, and she is already in heaven, the rapture is history, and it is always spring-like in heaven, and the Bridegroom is coming to take her on a "date" as He has done apparently many times before. Song of Songs 2:13 Arise, my love, my fair one, and come away. This is not the rapture, this is a vision of joyous fellowship with our Lord which will likely happen OFTEN as we wait the 7 years during the tribulation on earth and we get to enjoy our relationship with Jesus before we return with Him to earth in Revelation 19. Apparently Jesus makes unannounced mansion visits. Word to the wise Saints. Keep it clean. This is point #8 in my 14 reasons why Watchers may want to take a look at December 31, 2017. This is point #4 in my 14 reasons why Watchers may want to take a look at December 31, 2017. Jeremiah 8:20 - "Summer is over, the harvest is past, and still we are not saved." In the Bible there are two seasons. Summer and Winter. Winter technically begins on solstice at 12/21. 10 days later it could be that Israel says, "Summer is over, the harvest (the rapture) is past (the rapture did not include us), and still we are not saved." What a sad statement. The rapture will make Israel jealous. Amen. I wonder if those 10 days of winter may refer to the "10 days of tribulation" for Smyrna in Rev 2:10? Have not worked that out. December 21 may have something to do with Hanukkah. This is point #13 in my 14 reasons why Watchers may want to take a look at December 31, 2017. 13. God wants us to know the finish line. God wants us to run the race like Paul but we cannot run a race appropriately unless we know where the finish line is. Now, PERHAPS, we know. Run appropriately. Like Zamporini in the famous world record shattering last lap at the 36 Olympics. Even if the date turns out to not be anything remarkable, it will be a good lesson on how to run a race. It we remain watchful, perhaps there will be more confirmation later and before the date. This is point #10 in my 14 reasons why Watchers may want to take a look at December 31, 2017. 10. MUST LISTEN TWO VIDEOS AS THEY MENTION DECEMBER 31, 2017 IN REFERENCE TO END TIMES. A. “Steve Quayle Amerigeddon Economic collapse will be on December 31, 2017” Search in you tube with the above title. Well I just listened to this presentation in its entirely and though the title says something about December 31, that it is less specifically stated in the complete video. However, they indicate a financial Armageddon is close and could be the end of the year. I will be looking for any information that gives specifics. B. There is another video by Paul Begley and it speaks of Obamacare and the fact that right now, still the law of the land, is that by December 31, 2017, chips are supposed to be applied to and installed in citizens. Are we at the edge of that? This is point #14 in my 14 reasons why Watchers may want to take a look at December 31, 2017. 14. Yes. IT IS ALL Speculation. Not setting a date. Only God sets the date. But He may have given His Watchers a clue or two. If 12/31 is the date God has set …amen, so be it. If it is not the date then I am sure when the REAL date occurs, it will also be a similarly breathtaking display of our Lord's sovereignty over sun, moon, stars, Scripture, Feasts, Calendars (Jewish and Gregorian), nature, and the plans of Satan and the hearts of men. You know, just like the 12/31 date WOULD HAVE BEEN had it actually been the date of the rapture!!!! Blessings Saints. Soon we rise and shine. Isn't this the most amazing time of HISTORY to be living in?!?!? If you come up with other ideas or confirmations then let me know. I think we need to keep watch for every day that is a multiple of 11 as those days could portend disaster. 99 days before December 31 is the Great Sign. 77 days before December 31 there were the apocalyptic FIRES in Portugal. 44 days before the sign the Argentinian submarine with 44 sailors is lost. Keep your eyes open as we approach December 31, 2017. There may be other judgments coming up or identified. Further, we await a complete fulfillment Rev 12:3,4 although that may be at the same time as we go up. The dragon fights as the redeemed Saints pour through his territory and he is unable to stop it and he is thrown down and received by whatever sack of bones receives him to become antichrist. Rev 12:7,8 . Admit it Saints…there is just something about 99 that God is attracted to. God approached Abraham when he was 99 years old about the some coming existence of his promised son, Isaac. And Saints, admit it, there are plenty of pictures about the birth of a promised son, the birth of a church associated by faith to Abraham and being called by the same Spirit that went and obtained a wife for Isaac and if so, you, are unavoidably, associated with 99. What is it about 99? Because it is evenly divisible by a trinitarian God? Divisble evenly by 3? Because when it is turned upside down the 66 is only divisible by two and perhaps Lucifer hates that. He needs to add another 6 to that number to be happy. And God knows it. So God uses it? Hmmm. I wonder. 12. The Torah reading for the Sabbath, the DAY BEFORE December 31, 2017 includes the last four chapters of Genesis, ending with Genesis 50 (completion), and with Joseph’s bones being RAISED out of the ground of Egypt to be taken to the promised land. Hey Saints! Want to leave Egypt? It is with NEW FLESH AND BONE that we "GO UP TO THE PROMISED LAND"
The Scripture Reading for this Sabbath is named Va-Yechi (And He Lived). AND HE LIVED!!!! Yes saints we will be born again to immortality and we will live. Thanks for the hint there Moses. 2. The Resurrection of Jesus was a great sign and GOD COUNTED from the GREAT SIGN of Jesus' Resurrection, 7 Sabbaths and then on the next day, as the disciples were gathered (and ready to wait the full count), but on the next day, the fiftieth day after the GREAT SIGN of the resurrection (the completion of the PENTECOST INITIATION COUNT), is when God got Pentecost in Acts 2 started. The effects of Pentecost continue presently and will UNTIL THE LAST DAY OF THE CHURCH’S EXISTENCE AS CORRUPTIBLE ON EARTH. That would be the rapture. Read the verses in Leviticus 23:15 & 16 and see if the count could be applicable. 15 And ye shall count unto you from the morrow after the sabbath, from the day that ye brought the sheaf of the wave offering; seven sabbaths shall be complete: 16 Even unto the morrow after the seventh sabbath shall ye number fifty days; and ye shall offer a new meat offering unto the LORD. Please do not be concerned that the end of Pentecost count (Day 50) will not occur on the same day (Day 1) in Acts 2 that beginning of Pentecost count started. It will end when the church is COMPLETE ON DAY 50. That’s why Pentecost, in Acts 2 started on DAY 1. Day 1 was the beginning of the Church. Day 50 is the completion of the Church, now READY FOR HARVEST. I know this will be difficult for some to take in. You weren’t taught this. I wasn’t taught this. I just saw this last week. Already I have had responses and semi-informed believers tell me, “Pentecost is in Spring!” They cannot see the difference between the initiation of Pentecost and the termination of Pentecost. Well there you go! That settles it. Sometimes it is hard for salty, old, saints, even like me, to learn something new in Scripture. Try Saints. I hope you are right about the nearness of the rapture. Redemption calls to me and it resonates deep. Lord, please come anytime before the end of the year!" Amen. To put it bluntly, I believe Scripture is telling us that December 31, 2017 is the rapture. I know, I know, I know … you don’t need to tell me what you are thinking. I am a seasoned watcher. I know all the responses from both non-watching believers, unbelievers, and other watchers who are watching other dates. I see a huge amount of spiritual beauty in what the Lord revealed to me about the count only last week. I would like to share it. Maybe some of these points, even if my conclusion is incorrect, will be encouraging. But here are 14 points that make me think the day of the rapture could be identified by God and by Scripture. I have been a fan of Amos 3:7 for decades. God will do nothing but that He tells His prophets first. Not saying I am right. I am looking at this date as a potential date that could bring God glory so I write about each point and why that point would bring God Glory below. 1. Enoch was raptured (technically translated) when He was 365 years old and December 31, 2017 is day 365 of the year 2017 in which the long awaited Great Sign of Revelation 12:1,2 occurred. The sign of Revelation 12 is about a resurrection! And by tying it into 365 we are forced to focus our attention on Enoch. Why? Because he was the first one RAPTURED (or something like it..don't know if he has an incorruptible body yet) AND THUS THE SIGN is for today, another sign of the resurrection from which the 120 disciples knew to count in Acts 2. How come nobody is counting yet? If you read my 14 points you will be counting and you will join the 120 plus disciples in faith, believing, and counting, and for them, God came unexpectedly early. The Great Sign of Revelation 12 is a resurrection sign. God set this up from the beginning Saints! I will tell you something about that sign that you probably do not know yet. Can you think of even one good reason why God had Enoch taken, before the tribulation of the flood, the first mention that people could actually be taken to heaven, when he had so much life left in him (just like all the raptured quick Christians will be but Enoch could have lived another 600 years) when he reached the year 365? Just one reason, Why 365?…why that number…waiting…(crickets)…I can not think of one except the “1.” Above. Thank you so much Martha, brother of Lazarus and also the prophet Moses for this hint. God did it before, straight from His own mouth, using the year for a day thing. Remember God had Ezekiel lie on one side for 390 days and then on his other side for 40 days. Then God explained it was indicative of a judgment of years that would come to Israel...and perhaps be multiplied (year 1948?). Day 365 of the year 2017 because it is the only year in 7000 that has the GREAT SIGN of Rev. 12:1,2 which is not just about a birth, it is A GREAT SIGN ABOUT A RESURRECTION...and it starts a count Just like Christ's resurrection was a Great Sign about a Resurrection that started a count. More on that later. I am sure some angel will pass out tags at the Wedding Supper. Not only the Bride but Enoch get to wear the "i GOT RAPTURED AT 365" button! Hah! I wonder if Enoch gets made incorruptible here at the rapture also. I know he is an Old Testament saint, but like Elijah, he is still needing what Jesus did on the cross and they have not died yet so maybe they are in fact part of the resurrected Church. This is point #7 in my 14 reasons why Watchers should keep an eye on December 31, 2017. High fives to Enoch when you see him. 12/31 is day 365 of the year! Grace is Perfectly Completed Anew – 5778. We are in that count now saints. It ends on 12/31/2017. The count started on 9/23, then 7 Sabbaths after, then morrow after, Saints begin count to 50. This is BONUS POINT KATHLEEN in my 14 reasons why Watchers should keep an eye on December 31, 2017. I already named my list "14 reasons..." so I have to keep that name for now even though I hope people will find other points in support that can be added. They will include your first name. It was Kathleen that reminded me December 31 was "the biggest drinking and partying day of the year." BONUS POINT KATHLEEN) I had another thought about how unique a December 31 rapture would be. Luke 12:40 says "Be ye therefore ready also: for the Son of man cometh at an hour when ye think not." i. This means at least, not at a regular already established Biblical Feast date. Some people want to see a rapture on a Feast day, primarily beginning of Feast of Trumpets, or at the end, the 8th day of Tabernacles or Hanukkah, or beginning of Pentecost. Those would be times you would expect or think. Jesus said to look for a time ye think not, that may mean not a feast day of itself...YET. After the rapture, I am sure, that day will be honored forever. December 31 qualifies. Can you imagine the confusion if at the last hour of the year, in Israel at least, while the crowd in revelry is ticking down the time to the New Year , they take a deep breath to scream in unison (a time ye think not) and as the minute hand reaches 12, AND, BOOM, the Saints are whisked away? Could be an amazing day when people are thinking not. December 31 qualifies. iii Most people are "thinking not" most of the time. The word "amusement" means "not thinking". If one engages in TV shows or movies one after the other, you are involved in "not thinking". You are engaged in watching myths, made up stories that try to program you to lose your touch with spiritual reality, truth and goodness. The thing that the media is trying to tell people these days in their myths of all kinds is get ready for the tribulation. There is a lot of hell coming to earth and entertainment loves to focus on that. 1 Timothy 4:7 But refuse profane and old wives' fables, and exercise thyself rather unto godliness. Other versions call profane and old wives' fables MYTHS. In my mind "Myths" would include all TV and movie drama, romance, fiction, science fiction, history, documentaries and all productions of NASA.